This fabric has a woven backing. If I use this fabric for a curtain, do I need to add a lining? Would the woven backing take the place of a lining? BEST ANSWER: If you’re thinking of lining drapes for light control, the fabric is dense and will block light very well on its own. However, if you’re thinking more about how they would look from the outside, I would suggest lining them. The woven appearance, to me, looks unfinished. 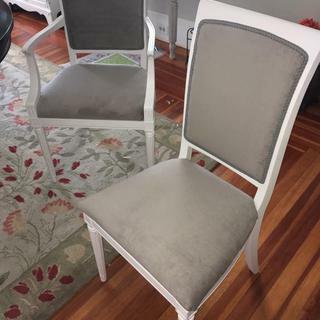 I used the fabric to reupholster dining room chairs and am extremely happy with the results. It’s a great quality fabric. Good luck! Can I upholster a chair with this? BEST ANSWER: Yes, this is a durable upholstery velvet. I used this to reupholster the drop in seats and backs of 6 dining room chairs and I am thrilled with the results. There’s just a slight nap to it that, i think, adds to the luxurious look of the “new” chairs. I also used a medium gray gimp from OFS for the backs that complemented the fabric perfectly Highly recommended!